This Times Tables workbook for 5 to 7s is a new addition to Priddy's successful wipe-clean workbook series. 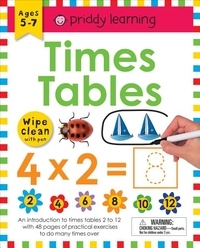 It comes with a dry-wipe pen, perforated flash cards, and 48 pages of activities to help children master their times tables. - The spiral binding means that pages lie flat for ease of use, and there are even tips for good handwriting habits. This book is a fantastic tool to help children gain confidence in math at an early age.